Left wing Matt Fraser has been reassigned to the Texas Stars today after a short stint in the NHL in which he scored his first NHL goal. Fraser got a chance to play on the top six in Dallas and is sure to come back fired up and ready to show that he deserves a longer stay in the show. He will be available for tomorrow's game against Chicago. Fraser, 22, returns from his first recall to Dallas of the season. The Red Deer, Alberta native appeared in two NHL games for the Stars and scored his first career NHL goal on Monday at Nashville. He currently leads the Stars with 35 points (24 goals, 11 assists) in 51 AHL games this season and ranks third in plus-minus (+12). Fraser still leads the AHL with 13 power play goals and ranks fifth in the league in goals (24). Earlier this season, Fraser was selected to represent the Western Conference at the 2013 AHL All-Star Game after posting a team-leading 35 points (24 goals, 11 assist) for Texas in 51 games so far this season. The 6-foot-1 left wing played his first career NHL contest last season on Jan. 24, 2012 against the Anaheim Ducks. Fraser went undrafted and was signed as a free agent on Nov. 17, 2010. The Stars announced two signings today. Gord Baldwin has been signed to a standard player contract after 18 games with the Texas Stars and forward Doug Jones has been signed to a PTO out of the ECHL's Gwinnett Gladiators. 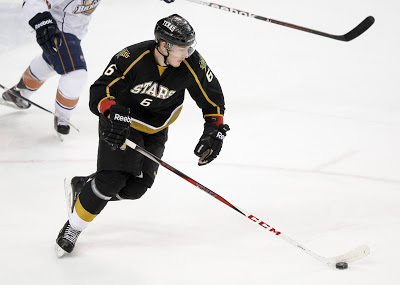 Baldwin, who started the season in Idaho, has been become a steady hand on the Stars' blue line with all of the callups and injuries to the roster. Locking him down for the season puts Texas into a good spot on defensive depth. As the season end draws near, the Stars need to make sure they have the pieces necessary to make a run. Remember Ethan Graham? 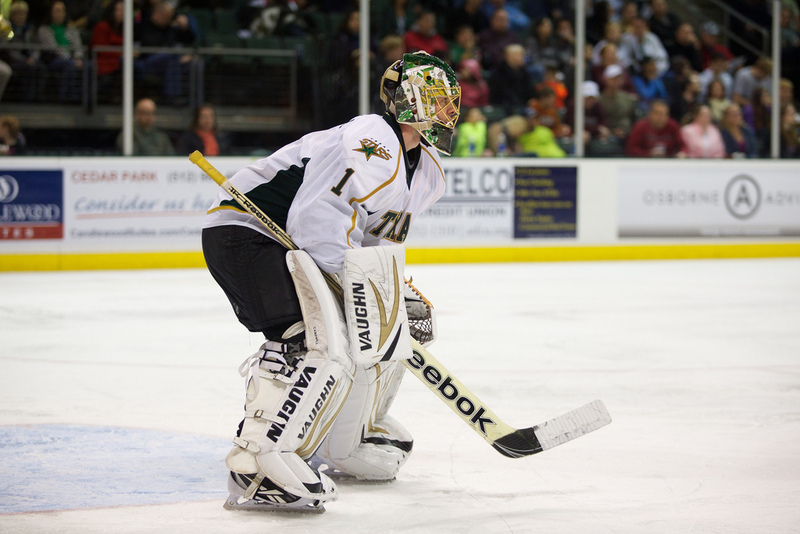 Secondly, the signing of Doug Jones can't be good news for the Stars overall roster health. There was some hope that the assignment of Austin Smith indicated that someone was coming back from injury this evening to allow for the extra forward spot. That appear to not be the case. In an interesting connection note, Jones played with Richard Bachman in Cedar Rapids of the USHL in 06-07. 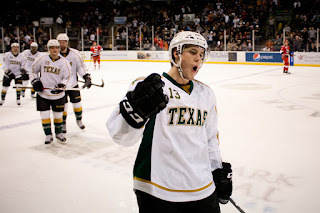 The Texas Stars, proud American Hockey League affiliate of the Dallas Stars, announced today that the team has signed right wing Doug Jones to a professional tryout contract, calling him up from the Gwinnett Gladiators of the ECHL. Texas also announced that defenseman Gord Baldwin has been released from his PTO and has signed a standard AHL contract. Jones, 25, began his first full professional season with Gwinnett and has 44 points (18 goals, 26 assists), 22 penalty minutes and a +16 rating in 54 ECHL games. The Marietta, Georgia native leads the Gladiators in shots (197), he is tied for the lead in goals and ranks third in both points and plus-minus. 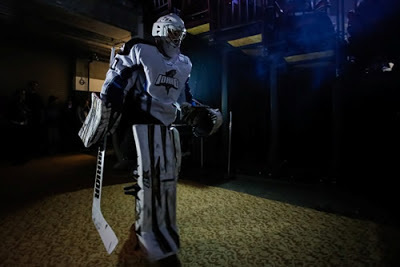 He signed a PTO with San Antonio on January 31st and made his AHL debut with the Rampage on February 1st against Rockford. 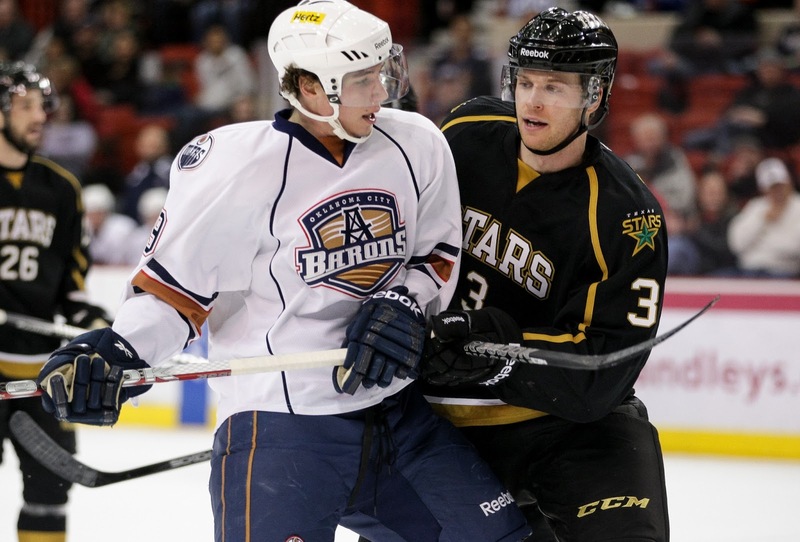 Jones played in two AHL games for San Antonio, recording zero points, before returning to Gwinnett on February 10th. 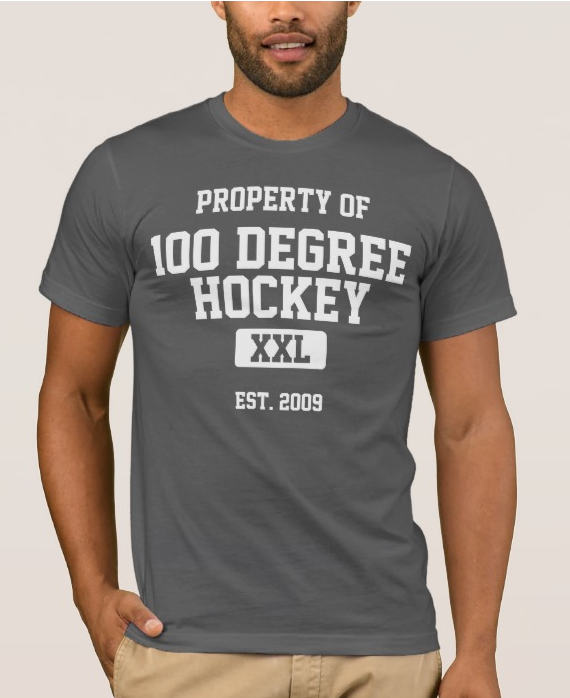 The 6-foot 205-pound forward played four years of NCAA Division I college hockey for Dartmouth College of the ECAC. In 127 career NCAA games for the Indians he tallied 107 points (29 goals, 78 points) and 107 penalty minutes. Jones led Dartmouth in scoring during his freshman year (2008-09) and was named to the ECAC All-Rookie Team. Baldwin, who turns 26 this Friday, is in his sixth pro season and has 3 assists, 24 penalty minutes and a +1 rating in 18 AHL games for Texas this season since signing a PTO on December 28th. 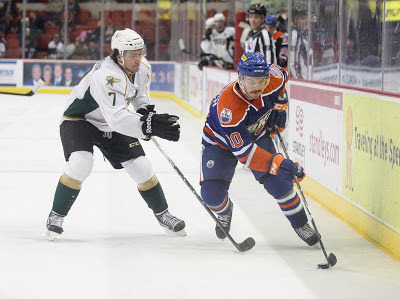 The Winnipeg, Manitoba native began the season with the Idaho Steelheads, the Stars’ ECHL affiliate, where he recorded 14 points (3 goals, 11 assists), 39 penalty minutes and a +11 rating in 26 ECHL games. Baldwin was drafted by the Calgary Flames in the third round (69th overall) of the 2005 NHL Entry Draft and spent parts of four seasons with the club’s AHL affiliate in Quad City and Abbotsford. To date he has appeared in 252 career AHL games and tallying 51 points (8 goals, 43 assists) and 231 penalty minutes. Baldwin (6’5”, 225 lbs) played three seasons of junior hockey with the Medicine Hat Tigers of the Western Hockey League, where he played for Texas Stars head coach Willie Desjardins. He was a member of the Medicine Hat squad that won the 2007 WHL Championship and went to the 2007 Memorial Cup Tournament. The Oklahoma City Barons are not pushovers, and the Stars would do well to remember that going into tonight's contest beaten and bruised from injuries and callups. Half of the players the Stars will have on defense this evening weren't even with the team the last time that these two clubs played only ten days ago. After the last set with Texas, OKC played and split two games with the Aeros last weekend with Yann Danis starting both contests. Texas comes into Oklahoma with a chance to tie their franchise best win streak at six, which was set this season on January 13th also in Oklahoma City. Anything resembling that 3-0 contest would be a solid outing for a Stars team that wants to keep ahead of the always looming Charlotte Checkers in the standings. 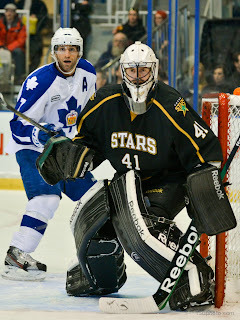 Also notable are the Stars' seven game point streak and the recent contributions of Jack Campbell. Campbell has started each game in the streak and allowed fewer than two goals per game (nine total) and tallied a .933 SV%. Campbell has talked about the difficulty of riding the bench and the difference in being the starter versus the backup. It's pretty clear why Campbell has never been a backup in his career given his play over the past month. The biggest thing to watch for will be what the Stars coaching staff can do with the defense. Looking at the defensive lines, only Carl Sneep started his season in the AHL this year. If Doug Lidster and Willie Desjardins can continue to work their magic with this group and get another win, this stretch has to put Desjardins in the discussion for AHL Coach of the Year. 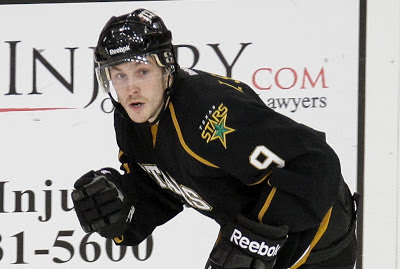 In a somewhat expected move, the Stars assigned forward Austin Smith to the ECHL's Idaho Steelheads today. Smith was called up immediately following the end of the NHL lockout and played in 12 games since that point and 16 overall this season. Smith has fallen out of the regular lineup and has not played since February 12th against Houston. The rookie winger has some notable size issues on the ice and tends to get bumped off the puck easily. Smith is a goal scorer at heart and needs to get minutes to do that and continue to grow his game. He certainly isn't getting those minutes in Cedar Park. 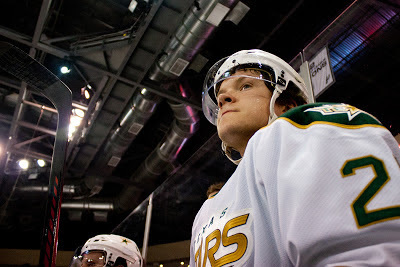 Smith, 24, has been recalled to Texas four times this season and has appeared in 16 AHL games for the Stars, posting three points (2 goals, 1 assist) and 6 penalty minutes. The Dallas, Texas native returns to Idaho where he has played in 23 ECHL games this year, recording 30 points (19 goals, 11 assists), a +17 plus-minus rating and averaging 1.30 points-per-game. 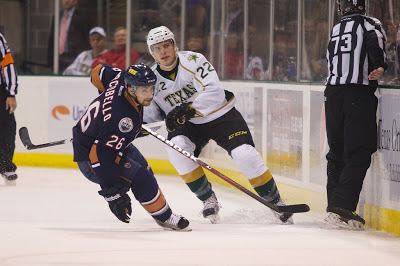 Smith has appeared in 28 career AHL games for Texas over the last two seasons, tallying six points (2 goals, 4 assists) and 14 penalty minutes. 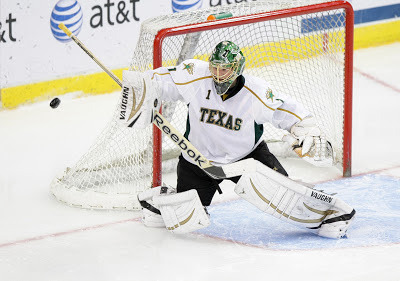 He was Dallas’ fifth round selection (128th overall) of the 2007 NHL Entry Draft. The Texas Stars made it to six healthy defenseman this afternoon with the return of Carl Sneep from a short recall to Dallas. Dallas D-man Trevor Daley was activated off injured reserve, which returned the recently acquired Sneep to Texas. The Stars now have the following defenseman healthy: Carl Sneep, Gord Baldwin, Hubert Labrie, Jace Coyle, William Wrenn and Jacob Johnston. Captain Maxime Fortunus made the trip with the team but it is uncertain if he will play tomorrow. Patrik Nemeth and Tyler Sloan did not make the trip. Texas announced today that they have signed defenseman Jacob Johnston to an amateur tryout contract. Johnston played four seasons at Dalhousie University of the CIS. He was 11-35-46 in 109 games of work in that league. 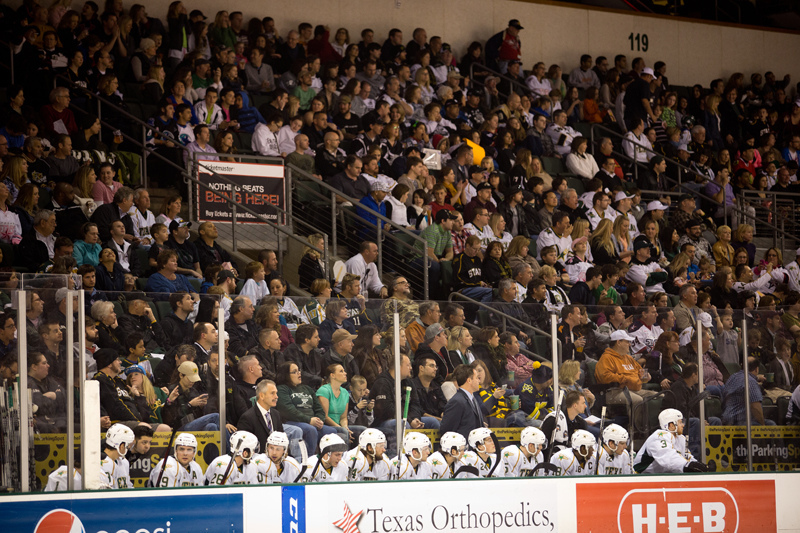 This is the first ATO of the season for the Texas Stars. The Stars still have at least one more slot to fill on the blue line, either by tryout contract or by assignment from Dallas. If Trevor Daley can play tonight for Dallas, Carl Sneep would be assigned. However, Dallas has to have a backup. In an interesting note, Johnston played four games with Cornell in 2007-08, lining up along side former Star Ray Sawada who was then in his senior season for the Big Red. The Texas Stars, proud American Hockey League affiliate of the Dallas Stars, announced today defenseman Jacob Johnston has signed an amateur tryout contract. Johnston, 24, joins Texas from Dalhousie University of the Atlantic University Sport (AUS) conference of the Canadian Interuniversity Sport (CIS). The Sudbury, Ontario native appeared in 28 games for the Tigers this season, scoring 13 points (3 goals, 10 assists) and 50 penalty minutes. Over his four-year career in Halifax, Nova Scotia, Johnston played in 109 career CIS games for Dalhousie, posting 46 points (11 goals, 35 assists) and 138 penalty minutes. The defenseman also played one season of NCAA Division I college hockey with Cornell University of the ECAC, appearing in four games with the Big Red and scoring one goal. The Stars finished up their weekend with a 4-2 win in Cleveland, stretching their win streak to five games, one short of tying the franchise record set this year at six. Jamie Oleksiak contributed two power play goals on ten total shots in the game, including the game winner. Carl Sneep picke dup his first goal as a Star and Mike Hedden had the insurance goal in the third period. Overall, Texas went two for nine on the power play as an undisciplined Lake Erie crew playing their third in three nights gave up too many man advantages. Jack Campbell won his 13th of the season, stopping 27 of 29 in front of the largest crowd that Texas has playing in front of this season at over 12,000. The Monsters and Stars traded penalties but not goals in a mostly even first period. The first scoring came in the opening minutes of the second. Relative newcomer Carl Sneep accepted a pass from Tomas Vincour and blasted the puck from point and past Calvin Pickard for his first of the season and first as a Star. The power play got revved up in the middle of the second, scoring on consecutive opportunities and both off the stick of Oleksiak. Taylor Vause found the rookie blueliner open in the right circle for the first tally with Oleksiak roofing the puck over Pickard for the 2-0 mark. Just three minutes later, Oleksiak collected his sixth goal of the year on a netmouth scramble off the initial shot from Tomas Vincour. The Monsters would fight back, scoring power play goals of their own. Karl Stollery went first just before the end of the second period. A simple point shot through traffic beat Jack Campbell to breakup the shutout bid. The period would end at the 3-1 score with shots in Texas's favor by a solid 33-19 margin. The clubs would trade goals in the third period, not ultimately affecting the games outcome. Mike Hedden regained the Stars' three goal lead early in the third as he received the backhand pass from Justin Dowling on a two on one and beat Pickard high for the 4-1 score. The goal would end Pickard's night. Lake Erie collected one more before the end of the game, regrettably a power play goal. The Stars allowed two on four total opportunities, a flaw in their game that they know they need to improve on. 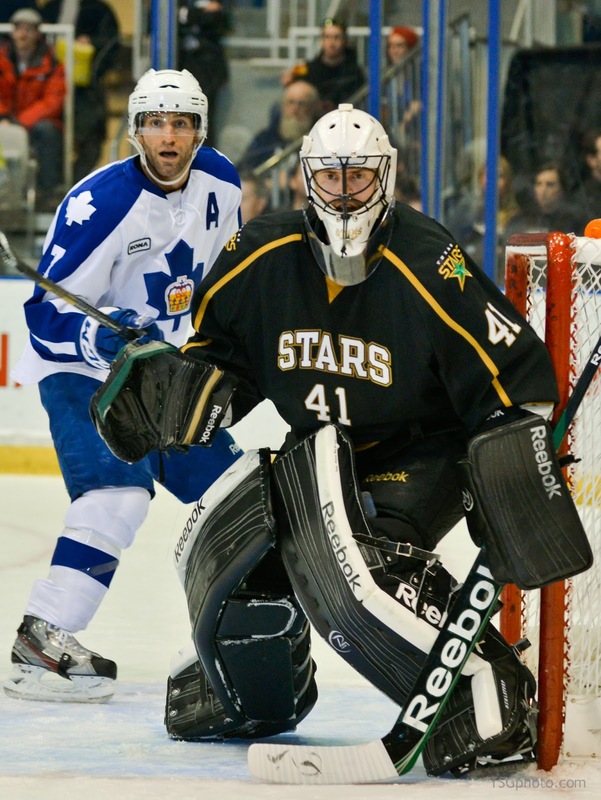 The Stars retain their hold on first place in the league, moving to 74 points on the season. 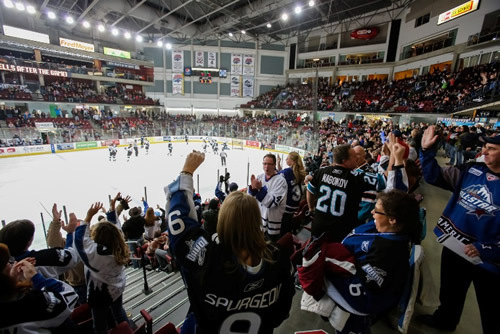 Charlotte beat Abbotsford to move to 69 and is their closest challenger in the Western Conference. The Stars will stay on the road, playing Oklahoma City on Tuesday before returning home next weekend. The Texas Stars really stunned the hometown crowd last night as they came back to win last night's game 4-3 in the shootout. Tonight's crowd is expected to be even bigger in Cleveland and the Monsters will surely remember the events of the prior game quite clearly. Overall, this team is showing that it is really a legitimate contender in the West. Despite roster shuffling previously unseen in Austin, Coach Desjardins' club keeps winning. There are some little things that they'd like to improve; there always will be. But the number that matters, wins, continues to tick up night after night. Pickard has started the past two nights so it's probably Patterson in net for LE. Campbell could start for Texas again and likely will. If you didn't believe the Stars were legit before tonight, Texas's 4-3 comeback shootout win over the Lake Erie Monsters should make you sit up and take notice. Losing 3-1 going into the third period, goals from Francis Wathier and Jamie Oleksiak pushed the score to 3-3. Jack Campbell stopped five in the overtime and five of six in the shootout for the win. Tom Wandell has the shootout game winner and two assists in regulation to help the team to the win. Texas started the game with a five minute power play but suffered the same fate as they had at home against Houston last week in a similar situation. The Stars had a chance to score early but the power play couldn't get churning off the major 71 seconds in. Tomas Vincour scored the first goal of the night as he beat Calvin Pickard off a solid pass from Tom Wandell. It was Vincour's third goal on the trip and Wandell's second assist. The Monsters tied it up just a few minutes later as Mike Connolly redirected a shot from Karl Stollery past Texas tender Jack Campbell. The rookie netminder didn't have a chance on the shot, and it was tied at one all. A rebound tally for Paul Carey set the score at 2-1 late in the first period. Texas would outshoot the Monsters 12-8 in the second period, but Lake Erie was the club with the period's only goal. With David van der Gulik in the box for interference, Mike Connolly picked up his second of the night on the penalty kill and put the game at 3-1 for the Cleveland club. The Stars had a 4-12-2 record coming into tonight's game when trailing heading into the third period. They would add to the win column tonight as the comeback kids did it again. Francis Wathier picked his spot from the right circle off the pass from Tomas Vincour to make it 4-3. Coming into the last minutes of the game, Texas pulled Jack Campbell for the extra man. Oleksiak collected his own rebound with 66 seconds left and scored his fourth of the season, tying the game at three and stunning the home town crowd. William Wrenn picked up his first AHL point on the primary assist. The Stars would outshoot Lake Erie 15-8 in the period trying to make the comeback. Overtime saw Jack Campbell stop five shots to Pickard's two and the game went to a shootout. Tied after five rounds, the Stars went into extra rounds, as is their custom. Coming in forehand, Wandell went backhand in the sixth round to beat Pickard and give Campbell the chance to win the game with a save. Brad Malone failed to score as Campbell stopped his backhand shot and won. Texas will stay in town to play Lake Erie again tomorrow night. 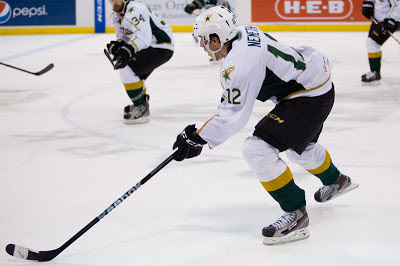 With healthy defensemen at a premium on both the Texas and Dallas roster, the Texas Stars were feeling a little bit skittish today on the injury front. According to Alaska Aces' press release and the ECHL transaction sheet, Texas has signed William Wrenn, a rookie defenseman playing his first pro season with the Alaska Aces of the ECHL. Wrenn has 5-16-21 in 51 games in the ECHL. He has one previous AHL callup to the Worcester Sharks. He had no points in three games. Wrenn was drafted by the Sharks in the second round of 2009 but was not signed. He played for Portland in the WHL prior to turning pro. Texas is next in action at Rochester tomorrow. Alaska Aces defenseman William Wrenn has been loaned to the Texas Stars of the American Hockey League, Aces Head Coach, Rob Murray announced on Tuesday. The call-up to the AHL marks the second of the year for Alaska's rookie defenseman. Wrenn, 21, made his AHL debut in January when he appeared in three games for the Worcester Sharks. The 6'1", 210 lbs. defenseman is a former second round (43rd overall) draft pick of the San Jose Sharks - Worcester's NHL affiliate. He has 21 points (5g, 16a) in 51 Aces games this season. Wrenn is currently the fourth highest scoring rookie defensemen in the ECHL. A local product from Anchorage, Wren represented the Aces in the 2013 All-Star Game. He began this season in Worcester's training camp. Wrenn's call to the Stars marks the fifth AHL different team that has called up players from Alaska this season. The Aces have also sent players to the Sharks, Oklahoma City Barons, Houston Aeros, and Toronto Marlies. 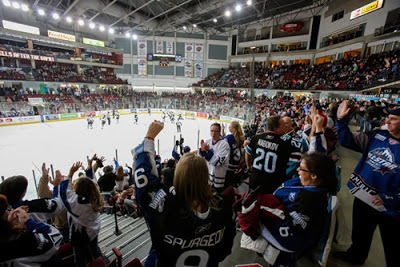 Alaska additionally sent players to AHL training camps in Abbotsford and Lake Erie. Sticking around for another night of hockey are the Oklahoma City Barons. Last night, the Barons saw their 3-1 lead evaporate at the hands of the Stars' first line and will surely be looking to avenge such a loss. Texas, of course, wants to avoid needing any late game theatrics on the whole. 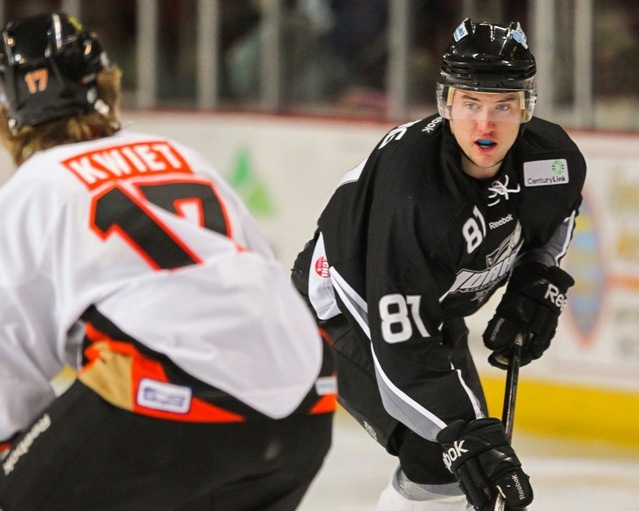 Mike Hedden commented, "[The Barons] play physically and hard and we got away from that [ourselves] in the second. We have to come hard and play the full 60." The Stars can be expected to roll with Jack Campbell again in net, who did a fantastic job of keeping the team in last night's contest through a rough second period. 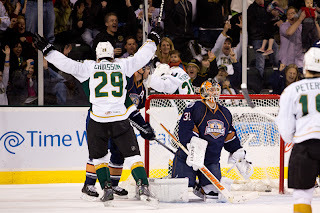 Cristopher Nilstorp looks to be headed to Dallas with last night's lower body injury to Dallas starter Kari Lehtonen. Depending on how quickly Tyler Beskorowany can get into town, the Stars could potentially hold off on starting the callup chain since Dallas does not play again until Sunday. Fellow Swede Patrick Nemeth also may not be in the lineup for Texas tomorrow. Both he and Tyler Sloan left the game in the third period and did not return. The Stars might be very lucky to have both Hubert Labrie and Gord Baldwin in town.